The operators of a voluntary bus service have welcomed a council move to arrange car parking while passengers enjoy their shopping trip. 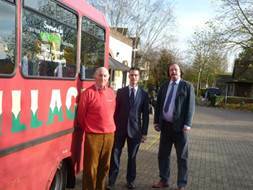 The Villager service which operates services from Chipping Norton taking in villages including Fifield and Stonesfield to Witney has secured parking at Langdale Hall, thanks to the intervention of Witney Keith Gowing, Cllr Toby Morris, Cllr Jeff HaineTown Council and West Oxfordshire District Council. Keith Gowing, Chairman of The Villager, said: “We had previously parked in Le Touquet Square but it was not ideal and centre management wanted us to move. But the only alternative was the traders’ area in the Woolgate car park which was too far from the shops for disabled passengers.